Every month The Sow Collective features an inspiring entrepreneur excelling in a niche industry. The purpose of this feature is to equip new business owners and content creators with entrepreneurial tips, tools, and motivation. This month's spotlight is on Where's the Frenchie: a pet travel brand for the modern dog owner. I first met Nikki of @WTFrenchie (an iconic Instagram account now boasting 110k+ followers) in 2014, when she hired me for social media consulting. When interviewed by LA Startup Magazine she shared, "The minute I hired a social media director [...] our social media output grew very quickly and the standards were raised. [Olivia] reached out to companies that I would never have thought of and our instagram (sic) community really grew from there!" Within six months Nikki was able to use her newfound knowledge to take on her Instagram account herself, zero in on a niche that spoke to her lifestyle naturally, and capitalize on that niche with an engaged (and rapidly growing) brand. Based in Los Angeles, Nikki's pet travel brand, Where's The Frenchie caters to a niche market of modern dog owners who live for chic lifestyles and luxe destinations. Despite Where's the Frenchie being newer on the scene, Nikki's work to build a strong Frenchie community for the last 4+ years helped solidify a loyal market. 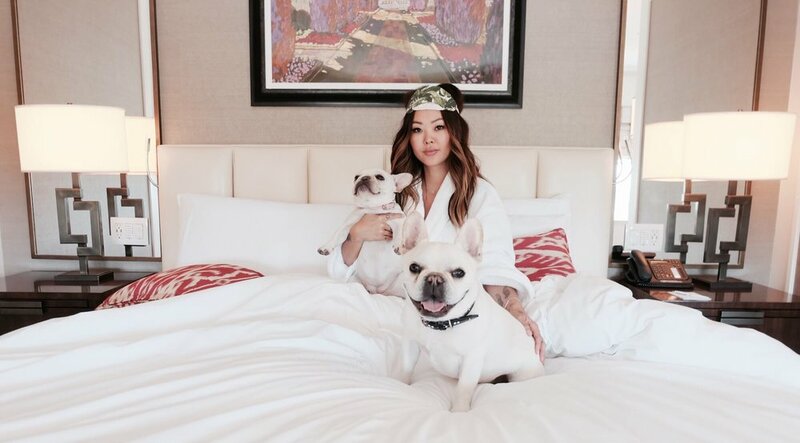 "I launched the [first] blog once I had a following on @WTFrenchie, so my french bulldogs technically [became] the 'influencers' -- which gave me a jumpstart on an existing audience," Nikki says. The turning point for those influencer pups? Pinpointing one or two key identifiers @WTFrenchie fans engage with the most, and developing content true to that niche. "There are a lot of Frenchie profiles -- and even two white Frenchies together -- so what about mine are different? I focused on them traveling and 'booping' (from a video of them that went viral) and saw a huge improvement." When asked what three things she wished she knew when she first started pursuing her dream, Nikki reminds us of wise advice: "Get inspiration from others but don't compare yourself to them." Do you just do something you love, create an Instagram page, and voilà! Have a business? The formula for transitioning from day job to dream job isn't so black and white. There is usually much overlap, and as Nikki can attest to, that overlap can increasingly lean toward your passion if you stay with it, invest in extra help when needed, and practice patience. Nikki shares, "I think starting any new venture or business takes a lot longer than planned, so I would say always keep your main job for awhile. It's OK to spend more hours on the "regular" job and a few hours here and there on your dream. Eventually, it'll start to become more and more hours on the dream until it becomes your full time. [My] new goal for the year is to outsource more. I have a control issue of trying to do everything myself! But I have outsourced a handful of articles for my blog and it was awesome to get content to fill up my blogs while I focused on other content that was more personal to me." Many influencers, professional content creators, and entrepreneurs dream of one day having an inbox full of brand sponsorship requests -- though it may not be an easy task. If you wonder what it's like to work with brands (or what to seek in the best ones), Nikki gushes about brands who give creative control and "really take the time to make you feel welcome (personalized card, treats, customized schedule, etc)." Working with those brands come with a price. Be expected to deliver the numbers to develop a positive reputation, and be communicative and professional. From reporting post-partnership analytics, promoting engagement that meets their goals (don't forget their hashtags!) and cultivating long-term client relationships, brand partnerships can go a long way if you play your cards right. Nikki's latest achievement: "A major hotel is trusting me to throw two big events at their venue. I brought in sponsors (literally with no experience), a targeted audience, and had a blast!" When you have consistent niche content and engagement, your numbers grow and partnerships follow. Instead of just hoping for bigger deals and sponsorships, Nikki lived her day-to-day true to her passion and repeatedly showed results. If you are inspired by Nikki's story, you're probably feeling motivated to get back to your Instagram page and gain more followers! But wait -- is vanity numbers the only ingredient in her recipe for success? She analyzed what her now larger audience responds to and solely focused on her "tribe"
She is still new at some things but taking the leap, trusting the social media community she's built, and doing the work! "I wouldn't have a business without social media! I've learned so much about marketing just through experimenting on social media," Nikki says as she reflects on how far she's come. "Stick to it!" What's next for Where's the Frenchie?